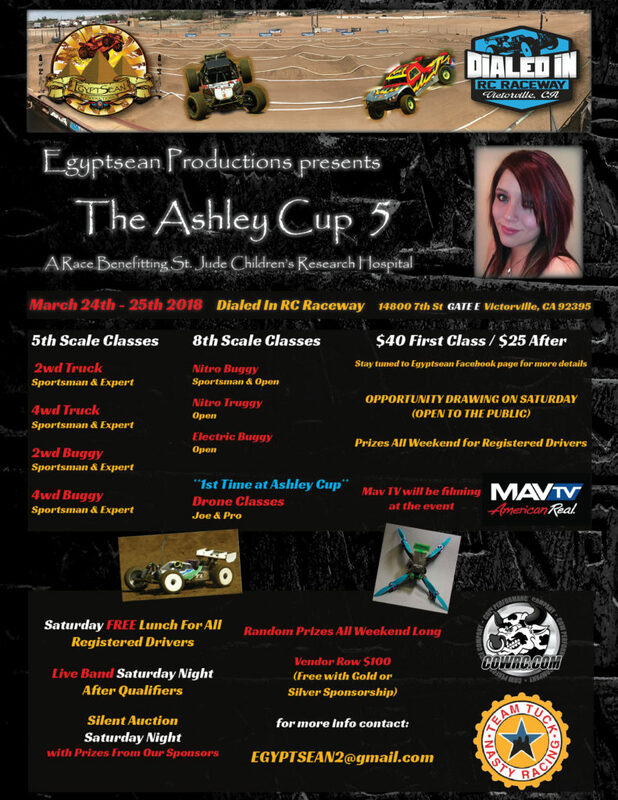 I am proud to say that the Ashley Cup is Back this year and will be on March 24th and 25th at Dialed IN RC in Victorville CA. We will have an 8th scale track, a 5th scale track and if all goes well we will also have drone racing. Qualifiers on Saturday and mains on Sunday. A live band Saturday night and free lunch on Saturday.Camping is available with 1 hookup for $20 or 3 hookups for $30. I am checking into getting a photo booth and jump houses for kids. We will have all the usual Ashley Cup goodies, giveaways and drawing. I created a facebook page for the Ashley cup 5 event so everyone can stay up to date on what is happening with the event. Keep an eye on facebook and /or the website for all of your ASHLEY CUP 5 info. Guests can also book by calling, 760-245-6565 and requesting the Ashley Cup 5 rate or reference Group Code ASH. Guests can also book by calling, 800-465-4329 and requesting the Ashley Cup 5 rate or reference Group Code ASH.